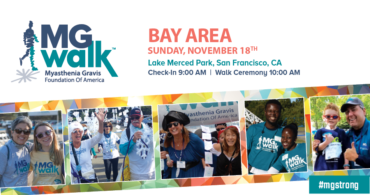 Participants affected by myasthenia gravis will gather to celebrate the lives of MG patients, physicians and caregivers, and walk to raise awareness and funds to support the Myasthenia Gravis Foundation of America (MGFA) at the Bay Area MG Walk on Sunday, November 18 at Lake Merced Park in San Francisco. The MGFA is the only national volunteer health agency dedicated solely to the fight against myasthenia gravis and to serving patients with MG. With monies raised from the MGWalk, the MGFA is committed to finding a cure for myasthenia gravis and closely related disorders, improving treatment options and providing information and support to people with myasthenia gravis through research, education, community programs, and advocacy. At the Bay Area MG Walk, many have made a major contribution to making the world aware of myasthenia gravis and contributing to MG research and patient programs. Now, we’re asking them to do even more. We want Walkers to wear their T-shirt, talk about the Walk, and help raise funds towards the mission of the MGFA. Please help us spread the word about MG and the MG Walk everywhere you can. To learn more about what you can do for MG Awareness, visit the MGFA website at www.myasthenia.org and the MG Walk website at www.MGWalk.org.